*Because this is such a large group, they may be dismissed slightly after 9 PM if necessary. This information is for the Mahwah TRAVEL Baseball Program. If you are looking for the Recreation program please select the menu item "Recreation"
Visit your Travel Divisions Unique Page - click the menu items above this page. Grade Age vs. League Age - Which is Right ? Q? Should your players be playing at their Grade Level or Age Level ? A: Mahwah Travel Baseball encourages "Grade" age, not DOB. Playing your grade ensures 2 years at each field size. 2 Years at 60/90 (7th and 8th Grade). ALL Freshman play together (you don't "play down" to 8th grade /14u baseball) as a Freshman. While it is tempting to "play down" to a lower grade because your players age allows them to do so they will not be playing at their "grade Level. 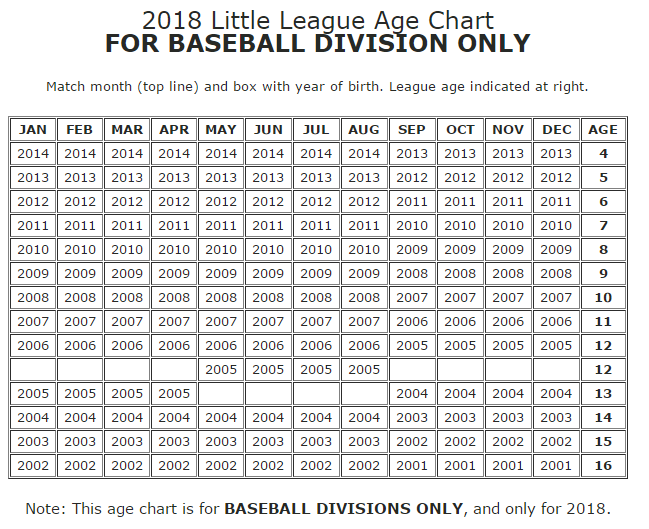 This will lead to having only one year at 60/90 Baseball, and losing a year of development while playing on a smaller field. Mahwah typically uses "Grade Age", however some players may qualify to play down (League Age Eligible).